I was working away the other evening on my friend's civil war print quilt when I heard the flap-flap-flap of wings behind me and then felt the "thud" as George landed on my left shoulder. I guess he decided I needed supervision. 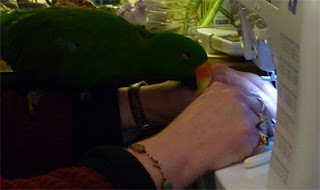 He climbed down my left arm, snuggled his little body into the crook of my arm, and sat there contentedly grinding his beak and watching as I continued to sew the pieces into blocks. 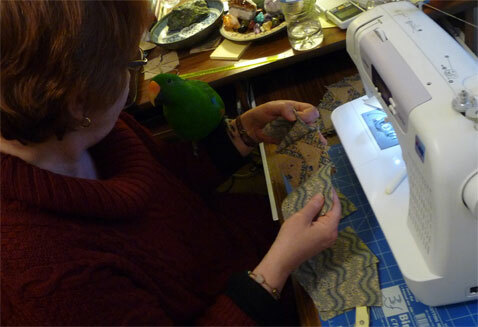 And here he is, giving me advice about how best to put a strip together. Not content simply to advise me, he eventually decided the "whirrrrr" of the machine was just too interesting. 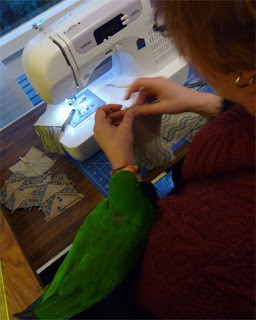 It was at about this point that I decided I didn't really need George's assistance... he was blocking my view and one of us was going to tangle with the sewing machine needle. 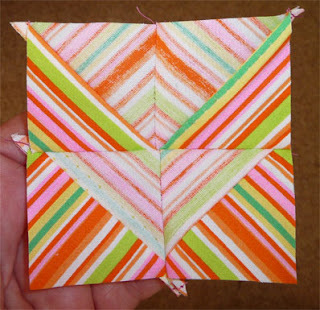 As you can see, there are triangles in this one - 8 large ones and 32 little ones. I'm not really wanting to cut out a lot of triangles and then fiddle with them, not when I know there's a shortcut! A friend of mine (who happens to quilt and blog!) 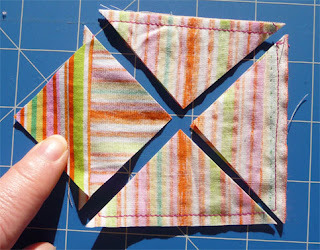 posted a tip on her blog (have a look here) for making triangle blocks. It's brilliant! It basically involves stitching the edges of a square and then cutting diagonally through it twice. I want to make my triangles using that shortcut. But the smaller triangles in red and dark blue in the diagram above will be striped material. Will the shortcut cause any headaches with that? And have I correctly calculated the size of the starting block so that I end up with a finished patch that is 3.5 inches square? 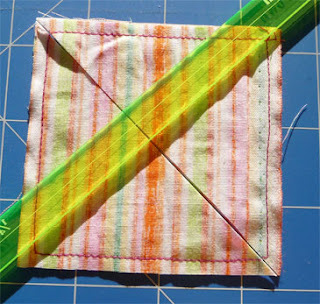 Then I cut again diagonally, and now fold back to see the result (as you can see below, I deliberately sewed right side facing wrong side so I wouldn't get confused about the directions of the stripes. 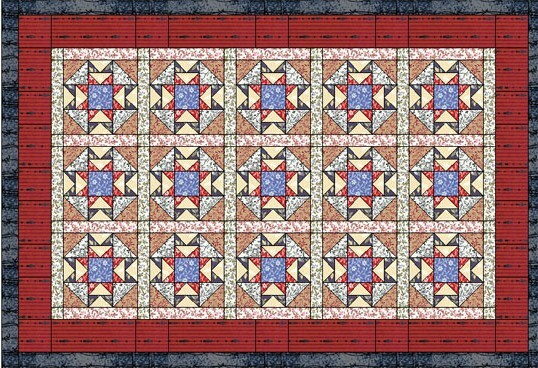 Below is the finished square. It is exactly 3.5 inches, just as I wanted it to be. But I can see a slight problem in that the stripes end up in different directions. Yeah - a bit of a headache, but as long as I'm careful about how I match up the triangles as I assemble the blocks, I should be able to complete a harmonious design. 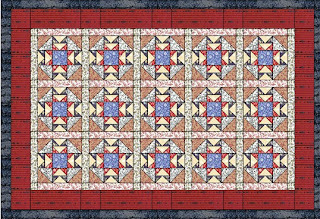 15 blocks in the quilt give me 615 pieces in this quilt - and that's without the borders! I've got that tree quilt top pieced together, but have just shoved it into the UFO closet for now. 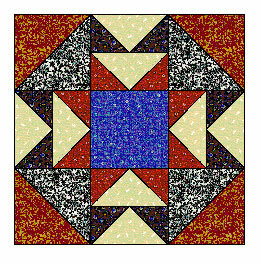 Instead, I'm diving into another project - a quilt for beloved friend Julie. 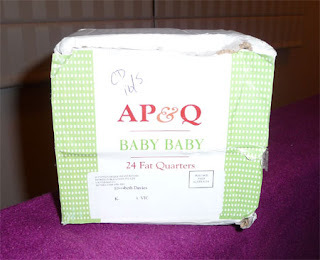 She's got a special birthday coming and I really wanted to give her something special, so on a trip we made together at Spotlight, I introduced her to the fat quarter table (devilish of me, I know...) and she and I went wild. 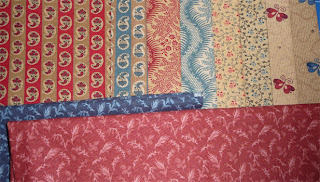 We found 2 pre-cut rolls of American Civil War prints - and the price was "divine" (as Julie would say). I grabbed a roll and she grabbed one - and then she noted to more fat quarter bits that coordinated beautifully and grabbed those. 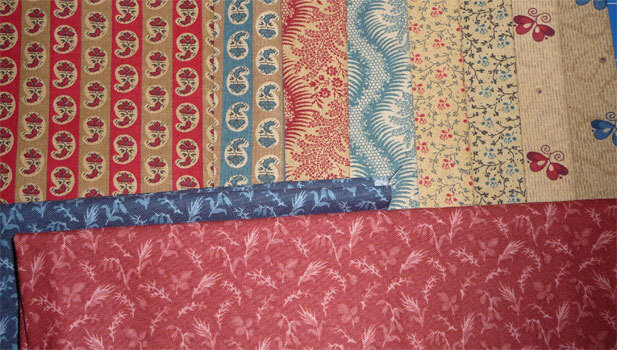 Below is a photo of the contents of the Civil War print roll (the 8 bits at the top) and the two fat quarters Julie found. Makes ya drool? Me, too! Unfortunately, one roll of the Civil War prints won't cover the top, so I sold her my roll. We'll also have to buy fabric for the two outer border bands, but that's OK.
Mystery Box - What's THIS?!?!?! Then I remembered! 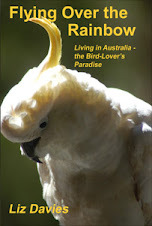 I recently subscribed to "Australian Patchwork and Quilting" magazine via an online subscription service which mentioned a "gift" for new subscribers. That's GOTTA be it! 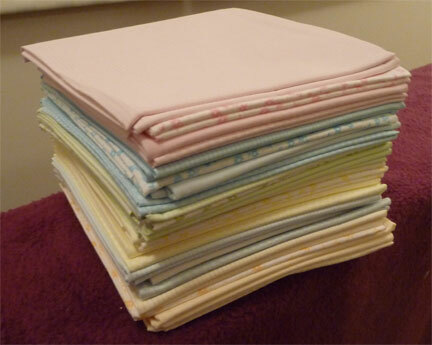 Well - these prints are lovely - all gorgeous soft cotton prints in "baby" colours. OoooOOo! I feel like I won the lottery!